This month was really slow. I knocked off another couple of boxes, but took a break while I was waiting on some library books to come available before I started something new. Of course, I do still have Jane Austen’s Emma on the go, but I really don’t want to read it. So first up, I finished Imaginary Jesus, which is completely perplexing and strange, but at least it was short. This definitely leads me to believe that I have a lot of books downloaded to my Kindle that I am never going to read. I sometimes feel a little panicked that there are so many books in the world to read, but not enough time to read them all. But, being realistic, most of those books are probably not worth my time. I also read Still Alice, which is was a little nervous about but ended up really enjoying. I have the movie waiting for me to watch still, and I’m interested in how they portray the relationships in it. I think I’m going to remember this book for a long time, because it kind of sticks with you in an emotional kind of way. The other book I completed this month is Yes Please by Amy Poehler, which was so disappointing to me. I read this book for my book club, and I really thought I was going to love it, based on the buzz I had seen about it. It seems to me that Amy has enough good will generated from her various things going on to paint the book in a better light than it would have been just on its own. I’ll be honest, after following her Amy Poehler’s Smart Girls facebook page, I was really hoping for a feminist diatribe/memoir. This wasn’t it, for sure. Next on my reading pile is the final two books in the Divergent series. They are downloaded to my Kindle and ready to go. I’m also considering tossing Emma to the side, and reading Lady Chatterly’s Lover for my old book instead. It’s also been banned, so that would check off yet another box. The whole question of books that have been banned is kind of a tricky one, to be honest. I feel confident choosing Lady Chatterly’s Lover as an example of a banned book because it’s kind of the poster child for book censorship. But so, so many books have merely been challenged, and not actually banned. Also, a book that is banned in one city may not raise an eyebrow in another. So should I stick with Emma, or toss it? That is kind of the big question. I would almost rather just watch Clueless again. 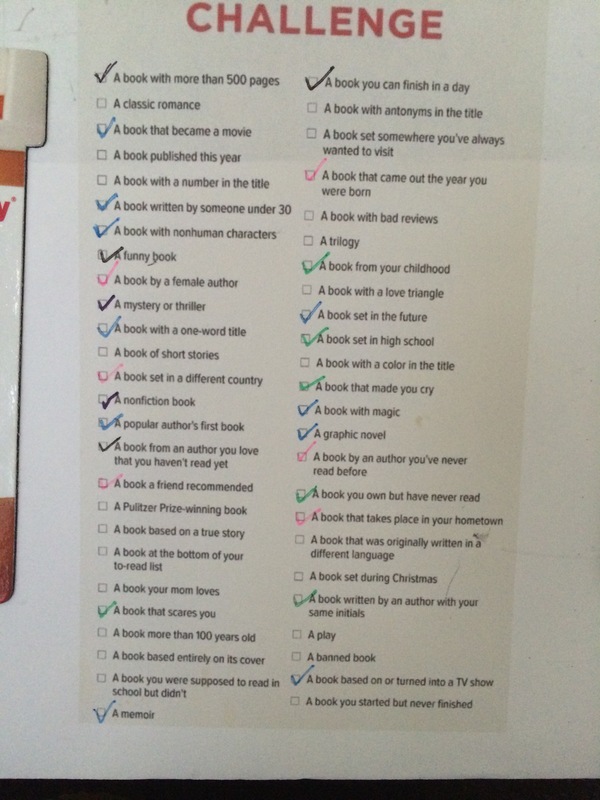 I checked off 5 boxes this month, so that brings my total up to 28 boxes total, and 17 books read.